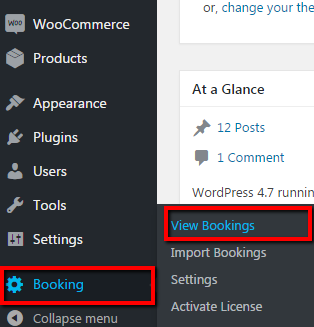 In this post, we will discuss where you can view all booked services in one glance in your WooCommerce store with Booking & Appointment Plugin with WooCommerce. We have All Bookings page where store admin can view, filter, print and download CSV of all the bookings of services that were placed on your WooCommerce store. We have Booking->View Bookings sub menu in the WordPress Admin menu section, and when selected, by default all the bookings will be listed in a table on All Bookings page. Order ID– It is a unique number of an order. Customer Name– Customer’s first and last name entered in checkout form. Product Name– Name of service booked by the customer. Check-in Date– This is start date selected by the customer for booking service. Check-out Date– This is end date selected by the customer for booking service. Booking Time– This is the booking time of the service selected by the customer for booking. Quantity– Quantity selected for service when booking is made. Amount– It is the Total amount of the order. Order Date– This will show date and time when an order is placed. Actions– It is the link to view order details of that particular booking. On the same page, you can also view the bookings in ascending or descending order by clicking on the icon near the column names like Order ID, Customer Name, Product Name, Check-in Date, Check-out Date, Quantity, Amount or Order Date. On All Bookings page, there are many other functionalities available like calendar view of bookings, filter the bookings, search for bookings, print and download CSV of bookings and also you can create new booking from this page. Let us look all these functionalities one by one in detail. New booking can also be added manually from this page by clicking on Create Booking button as shown in the below image. Clicking on this button will redirect you to “Add New Order” page where you can input customer details, add line items, and the details of the booking. You can refer to our post on creating manual bookings for the detailed description. On the View Bookings page, all the bookings are listed in the table. We also have a functionality to view all the bookings in a calendar view. We have Calendar View button on All Bookings page as you can see in the below image. Clicking on Calendar View button will redirect you to a Calendar View page where you can see all the bookings based on week, month and day. By default, week view will be displayed. You can switch to month and/or day view by clicking on “month” and/or “day” button. On the same page, you can create a booking by clicking on “Create Booking” button and even if you wish to switch to listing view then click on “View Booking Listing” button. Booking events will appear in the calendar for all the bookings placed on your WooCommerce store. Clicking on a particular event will show a Qtip with booking information like Order ID, Product Name, Customer Name, Start Date and End Date. You can download data of all, searched, and filtered bookings into a CSV file on click of CSV button available on All Bookings page. As you click on CSV button, a data.csv file is downloaded and all the booking details can be viewed in that csv file as shown in the image. We have Print button on All Bookings page to print all, searched, and filtered bookings. As you click on Print button, a print preview of all/searched/filtered bookings will be generated on the new window as shown in the below image. If you wish to search the booking then there is a Search box available on All Bookings page that allows you to search the bookings by “Order ID”, “Customer Name”, “Product Name”, “Check-in Date”, “Check-out Date” or “Order Date”. You can search by any of these options preferable to your needs. E.g I have searched for “Product Name” and all the bookings booked for same Product Name are listed in the booking table. Booking From Today Onwards – It displays booking records of current and future dates. Todays Check-ins– It displays all the booking records whose check-in date is today. Todays Check-outs– It displays all the booking records whose check-out date is today. Unpaid– It displays records of all unpaid bookings. Pending Confirmation– It displays all the booking records whose confirmation is still pending. Reserved By GCal– It displays details of bookings done via Google Calendar. We also have a custom date and time filter to filter the bookings. If you want to see bookings based on day, current week, month and year then you can select the required option from the Select a period drop down next to Bookings Over Time label. Once a required option is chosen from the drop down click on Filter button, booking records will be listed based on the selection. If you selecting “custom” option from the drop down of Bookings Over Time then four fields will appear to filter the bookings between dates and time. You can choose dates in Start Date and End Date as well as booking time as From Time and To Time to get the result for your custom filter. View Bookings page is a full fledge solution to view all the bookings of services in one glance on your WooCommerce store. On this page, you can search, filter, sort bookings in different ways as per your needs. Also, you can print those booking records as well as you can download CSV file of all the listed bookings using our Booking & Appointment Plugin for WooCommerce. You can also create new bookings manually and if you wish to see the order of a particular booking then that is also possible. If you wish to view all the bookings in a calendar view then you can easily view it by clicking Calendar View button. All the varied functions like view, filter, search, print, and download csv of bookings on your WooCommerce store can be done with great ease on All Bookings page with our Booking & Appointment Plugin for WooCommerce.